Sharp, realistic graphics create beautiful scenic vistas in this fun and addictive off-road racing game. Free full version off-road racing game! No banners, no ads, no in-app purchases! Whether you want to take a leisurely bike ride through the hills, mountains, and melting snow, or throw your hi-tech dirt bike into top gear and speed through the country landscape, this game offers you the possibility to do both. Spring is a tough time to ride a bike. Mud and snow create a perilous terrain. Guide your hero on a trip through the countryside. Enjoy the fresh air and mountain vistas, but beware of obstacles like broken tree trunks and tumbling boulders. Sharp, realistic graphics create beautiful scenic vistas in this fun and addictive off-road racing game. Easy gameplay allows even the beginner biker the chance to navigate these paths and trails. 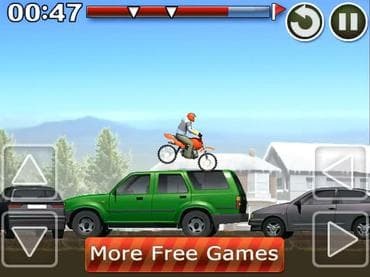 Play this free racing game today, easy rider, and feel the thrill of having the wind in your face. If you have questions about Off-Road Master game, please contact us using this form.